These shoes are pretty damn special. The designs are meticulously created entirely in fine glitter for a precise and gorgeous sparkly finish! 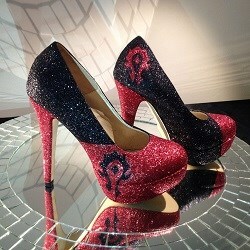 From the ever popular Wonder Woman heels to designs inspired by Game of Thrones and World of Warcraft. Then there's the Deadpool high heels, which have really got us drooling! Whichever pair you choose, you just know they're going to look spectacular on your feet. They're chic, they're unique, with a good slice of geek!